The breakfast set consists of a triangular tray, a sugar bowl, teapot, milk jug, high and low cups with saucers and porcelain teaspoons. 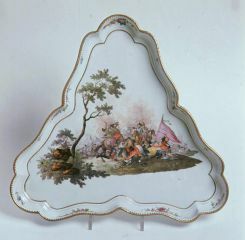 The tray has rounded corners and a bevelled, scalloped rim. The teapot is potbellied with a curving handle and a tubular spout. 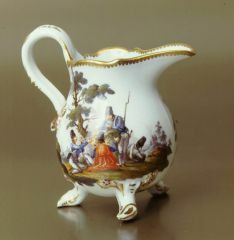 The milk jug has a potbellied body on three short legs imitating twigs, a curved handle and short lip. The cups and the sugar bowl are simple in shape, on a low round base, and without handles. 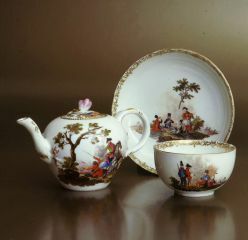 All parts of the set have gilt, lacy decorative edges. The knobs of the lids are in the shape of a rose. Each item of the set depicts a different war scene whose actors are Croatian border troops and the Pandurs of Baron Franjo Trenk, shown at moments of rest and while in action. Some of the scenes on the pieces are after Martin Engelbrecht’s prints. All items show the mark of the Meissen manufactory: crossed swords and a star, or a dot below and the impressed mark: X, P, 60, 64. 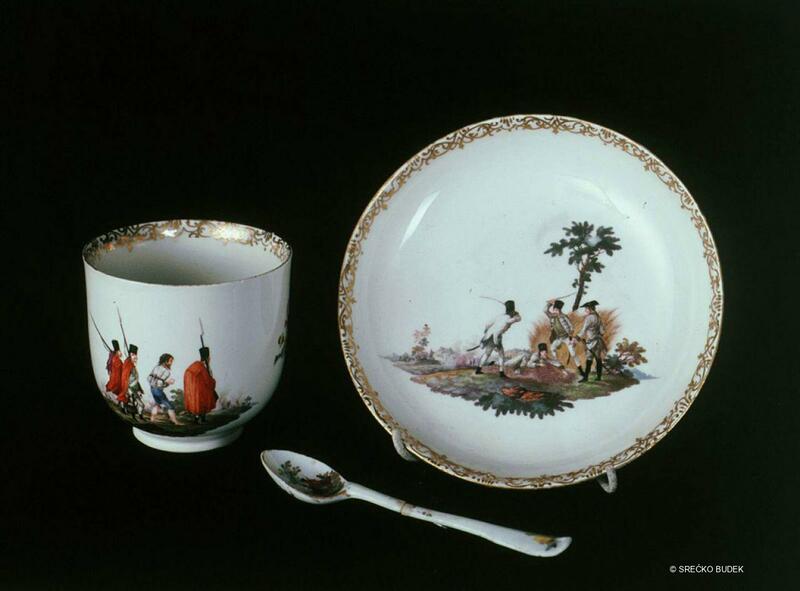 Adorning each item of the breakfast set are polychrome painted scenes of warfare with the soldiers of the Croatian border troops and the Pandurs of Baron Franjo Trenk. 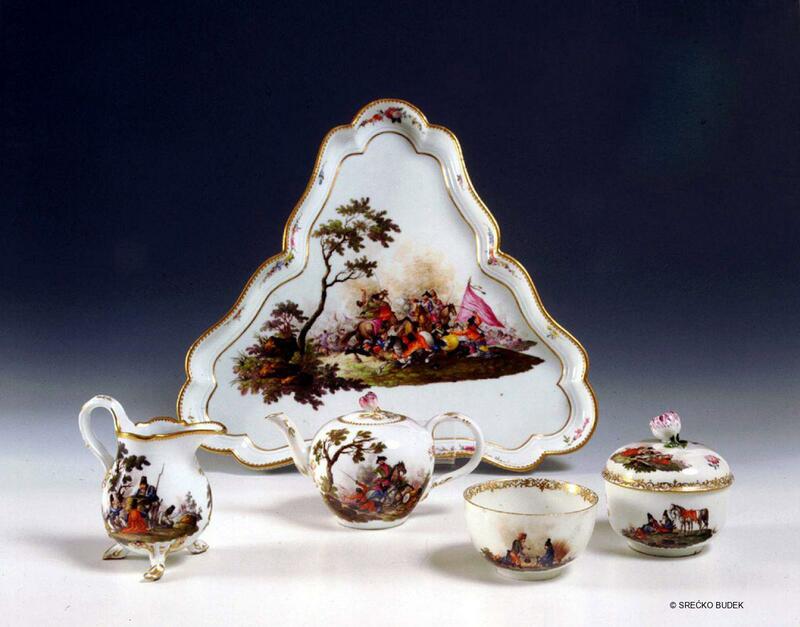 By stylistic analysis and from the marks of the Meissen manufactory. 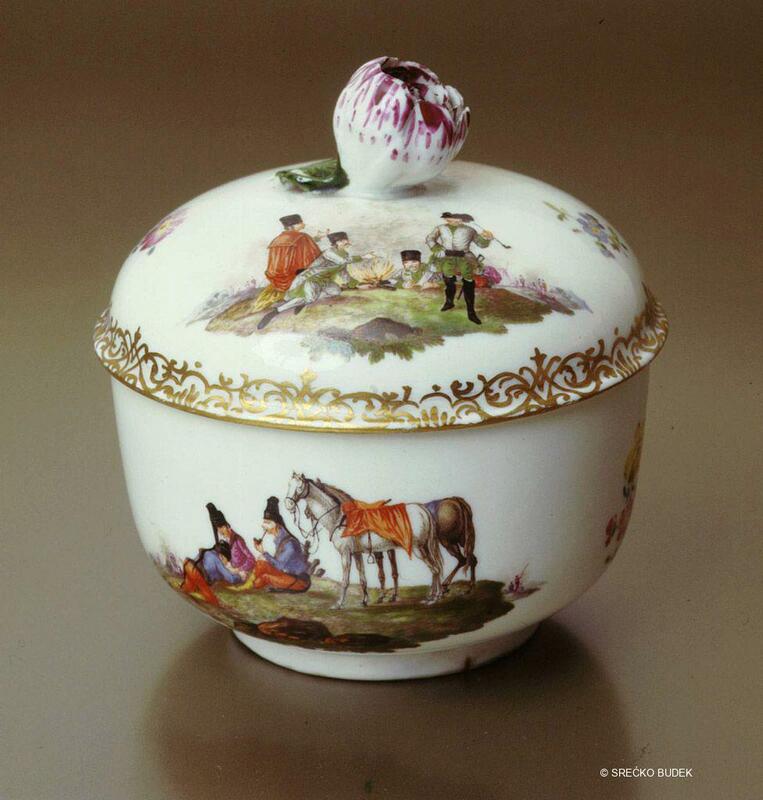 Purchased from the collection of the Zagreb art collector, Levin Horvath in 1885, 1888 and 1895. Staničić, S., "Ratni prizori s hrvatskim sudionicima na porculanu meissenske proizvodnje", Od svagdana do blagdana: barok u Hrvatskoj , Muzej za umjetnost i obrt, Zagreb, 1993, p. 170. Staničić, S., Porculan. Meissen-Beč. Zbirka keramike Muzeja za umjetnost i obrt, Zagreb, Zagreb, 2004, p. 60. Marina Bagaric studied Art History and Russian Language and Literature at Zagreb University, and was awarded her MA in the History of Architecture in 2006. She has been a curator at the Museum of Arts and Crafts since 1998, and since 2004, a Senior Curator and head of the Ceramics Collection and Architecture Department. She has curated exhibitions of contemporary Croatian ceramics, and is author and contributing author of various articles and catalogues associated with the Museum’s exhibitions: Art Nouveau in Croatia (2003), Tuscan Donations (2004) and Hidden Treasures from the Holdings of the Museum of Arts and Crafts (2005/6).